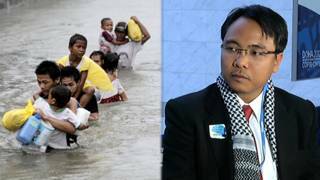 “If Not Now, Then When?”: Filipino Negotiator Pleads for Climate Deal After Typhoon Kills 500 | Democracy Now! climate delegate from the Philippines and a member of the Philippines Climate Change Commission, speaking to negotiators at the climate change summit. AMY GOODMAN: This is Democracy Now!, democracynow.org, The War and Peace Report, and we are broadcasting from the Qatar National Convention Centre. It is supposed to be the last day of the climate negotiations. 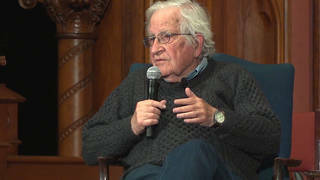 Today on Democracy Now!, we’ll be speaking with Venezuela’s chief climate negotiator, as well as a negotiator from the Philippines, where a massive typhoon has hit. But first we’re going to turn to Greenpeace executive director Kumi Naidoo. Not long before this broadcast, hundreds of people gathered right behind us on the media bridge at the center of the Qatar National Convention Centre, where the sculptor Louise Bourgeois’ spider is. It stands about 30 feet tall, and it has—and it has become the site of where people gather. When hundreds gathered, they sang a new song out of Belgium, calling for dealing with climate change now, and then Kumi Naidoo addressed those gathered. KUMI NAIDOO: My name is Kumi Naidoo from Greenpeace International. There are three questions that we have for our leaders. And when I ask the question, I would ask you to repeat after me. The first question is: If not now, when? PROTESTERS: If not now, when? KUMI NAIDOO: If not here, where? PROTESTERS: If not here, where? KUMI NAIDOO: If not us, who? PROTESTERS: If not us, who? KUMI NAIDOO: The next message we want to say is: Nature does not negotiate. PROTESTERS: Nature does not negotiate. KUMI NAIDOO: Stop playing political poker with the planet. PROTESTERS: Stop playing political poker with the planet. KUMI NAIDOO: Do not destroy our children and grandchildren’s future. PROTESTERS: Do not destroy our children and grandchildren’s future. KUMI NAIDOO: …they say they don’t have money. PROTESTERS: …they say they don’t have money. KUMI NAIDOO: We say this. KUMI NAIDOO: …why can’t a country find $60 billion to bail out the poor and bail out the climate and bail out the planet? PROTESTERS: …why can’t you find $60 billion to bail out the poor and bail out the climate and bail out the planet? KUMI NAIDOO: Thank you very much. AMY GOODMAN: That was Kumi Naidoo, the executive director of Greenpeace International, standing in front of hundreds of people. Yes, the climate talks have been taking place in the shadow of the devastating typhoon that struck the southern Philippines Tuesday. More than 500 people have died. Hundreds remain missing. A quarter of a million have been left homeless. “Yeb” Saño, commissioner of the Philippines Climate Change Commission, broke down as he called on negotiators to do more. NADEREV SAÑO: An important backdrop for my delegation is the profound impacts of climate change that we are already confronting. And as we sit here every single hour, even as we vacillate and procrastinate here, we are suffering. There is massive and widespread devastation back at home. Hundreds of thousands of people have been rendered homeless. And the ordeal is far from over. Madam Chair, we have never had a typhoon like Bopha, which has wreaked havoc in a part of the country that has never seen a storm like this in half a century. And heartbreaking tragedies like this is not unique to the Philippines, because the whole world, especially developing countries struggling to address poverty and achieve social and human development, confront these same realities. Finally, Madam Chair, I speak on behalf of a hundred million Filipinos, a quarter of whom—a quarter of a million of whom are eking out a living here in Qatar. And I’m making an urgent appeal, not as a negotiator, not as a leader of my delegation, but as a Filipino. I appeal to the whole world. I appeal to the leaders from all over the world to open our eyes to the stark reality that we face. I appeal to ministers. The outcome of our work is not about what our political masters want. It is about what is demanded of us by seven billion people. I appeal to all: Please, no more delays, no more excuses. Please, let Doha be remembered as the place where we found the political will to turn things around, and let 2012 be remembered as the year the world found the courage to do so, to find the courage to take responsibility for the future we want. I ask of all of us here: If not us, then who? If not now, then when? If not here, then where? Thank you, Madam Chair. AMY GOODMAN: That was Yeb Saño, commissioner of the Philippines climate negotiating team, speaking on Thursday before the U.N. climate change plenary. We turn now to two guests here in Doha. Heherson Alvarez is a climate delegate from the Philippines and a member of the Philippines Presidential Climate Change Commission. And we’re joined by Claudia Salerno, Venezuela’s vice minister of foreign affairs for North America and special presidential envoy for climate change, head of the Venezuelan delegation here at COP18 in Doha. I want to begin with Heherson Alvarez. My condolences on the tremendous loss in the Philippines right now, believe more than 500 people dead, 500 people missing, as a result of Typhoon Bopha in southern Philippines. Talk about the significance of this typhoon hitting as you are here negotiating around the climate. HEHERSON ALVAREZ: Yes. Well, it’s not only on the death—but death should be the first consideration—but on the destructive impact of this typhoon, because it’s hit an area which is fairly productive and where our exports come from. We export a lot of bananas, but the banana plantations were practically wiped out. And since this is the 16th typhoon in the year, one could really feel the anguish of the whole population. We feel that this continuing recurrence of disaster, in a more destructive and ferocious impact on the community, may not be abated. And we are all looking for some kind of a solution, some kind of an understanding. And it seems, to many of us who have studied this problem, the science and the way to approach it is already there for the delegates of this convention in Doha, so we were looking towards some bright light in Doha where this problem of ever-escalating and devastating typhoons would be abated. AMY GOODMAN: You have compared what’s happened in the Philippines to nuclear war. HEHERSON ALVAREZ: I did. But humanity seems to have been smarter at the time when mankind or two factions of humanity threatened to destroy the whole humankind, and we sent very bright negotiators. Here, we have 194 delegates, diplomats. I think the best brains of the nations are here. But we’ve been meeting and meeting and defining issues, understanding it, but we don’t seem to be capable of coming up with a lucid and a workable solution. Even now, we know the volume of carbon dioxide that must be reduced. Even now, we have agreed in Copenhagen that the heat or the warmth of the earth should not exceed 2 degrees centigrade. Even now, we know what we should do about the resources that must be pulled together in order to help the nations that are devastated through no fault of their own because of the impact of climate change brought about by our misuse or overuse or excessive use of resources. And yet, in this convention, we are unable to say these are the first steps or these given years we’ll solve the solutions, so that ultimately the poorer members of the human community that are being devastated may be able to go through this process over a decade. We can’t say that. We don’t seem to be able to give any answers where we can put a stop or manage this human destruction, this agony. What’s happened in the Philippines is a frightening scenario that can happen many times again, because the U.N. had pointed out that the Philippines is the three—one of the three most vulnerable, or the third most vulnerable—Tonga, Vanuatu, and the Philippines is third. And we are supposed to be undergoing a process of escalating more ferocious, more high-velocity storms. We were supposed to have 20 this coming year. And the next year, we’re supposed to be struck with 30. So you—you practically double up the destruction. It’s very frightening that you find this ruin, and then this body, this grand coalition, this grand meeting of humanity, is not able to assuage us and tell us, within three years, we will be able to take the initial steps, and in so many years there’s going to be the volume of funds which will be distributed to alleviate the destructive impact of climate change.